Alabama (11-5, 2-2) bounced back on the road for a much-needed win at Missouri. They will stay on the road when they travel to Knoxville to play the Tennessee Volunteers (AP: 3; KenPom: 5; NET: 3). The Vols enter with a record of 15-1 (4-0). Game time is 1 P.M. CT. ESPN2 will televise the game. My Two Cents: Big win for our guys on the road. It wasn't a clean game by any stretch, but they remained poised when Missouri made some runs at them in the game. With four of their next five games vs teams currently in the AP poll, that was as close to a must-win in January as it gets. This trip to Knoxville is going to be an extreme challenge. I watch my fair share of college basketball, and Tennessee is truly one of the best teams in the country. And it's not just because they're balanced on both ends of the floor (top 25 in both offensive and defensive efficiency at KenPom), it's because they are mature, well-coached, and have a chemistry that is rare in today's college basketball. There's a leadership on the floor that's palpable, every player seems to accept his role on the floor, the coaches don't seem to have to get after guys on this team often. I know Tennessee is a rival, but I really have to respect how this Vols team plays. As long as they remain healthy, they have as much chance to win the national title as any team. Not surprisingly, they do a lot of things well. They are top 50 at KenPom in effective field goal pct (7), turnover pct (36), offensive rebound pct (39), free throw rate (41). You name it, they do it good to great on the offensive end. When Alabama has struggled on defense, the root of the problem has been limiting points in the paint so the fact that Tennessee is 5th in the country in 2pt pct (58.2) isn't comforting. They're also a good 3-point shooting team (36.9), they shoot free throws well (76.7%). Defensively, they are top 20 at KenPom in limiting their opponents effective field goal pct. They are top 15 in block pct so they don't give up a lot of easy baskets. I can't say it enough times: Alabama has played some good teams this season, but Tennessee is a great team. Add in a Saturday road environment, and our guys are going to have to play their absolute best (or hope for Tennessee's absolute worst) to have a chance in this one. What does give me a modicum of hope in this game is that two areas that Tennessee has been average is opponent offensive rebound pct (ranked 216 at KenPom) and opponent free throw rate (233 at KenPom). 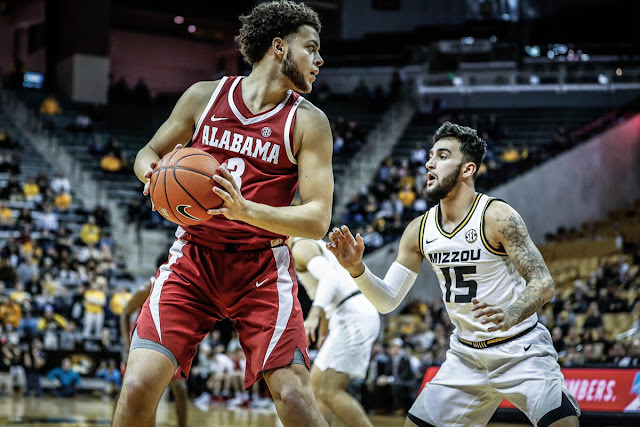 What are the two best things that Alabama has done this season: offensive rebounding and getting to the free throw line. Second chance points and taking the crowd out of it by getting to the line (as long as you make shots!) are vital to Alabama's chances at the upset. Tennessee has also been just average in forcing turnovers so if Alabama can limit their turnovers, thus limiting Tennessee's fast break opportunities, perhaps our guys can control the tempo and put some game pressure on the Vols. Players to Watch: In my opinion, Donta Hall is having an All-Conference type of season. He's leading the conference in double-doubles (8), and with the exception of a few off nights in November, he's been a steady player and a good leader for this team. Unfortunately, because Alabama has been a little up and down, it feels like he's off the radar when it comes to the league players that the national and local basketball guys talk about. That will change if he's able to continue his strong play in Knoxville against a team with arguably the two best players in the conference. Yes, the Tennessee team as a whole has been awesome, but Grant Williams and Admiral Schofield are without question the leaders of this team. Combined, they are averaging 36.5 ppg, 14.1 rpg, 6.7 apg, 2 spg, and 2 bpg. Obviously, Alabama has to find a way to limit those two, but keep in mind Tennessee has four other dudes that average double figures. I don't envy the coaching staff trying to come up with a gameplan for this one. Prediction: Tennessee is 15-1 on the season. Their lone loss was to Kansas at Madison Square Garden in overtime, in a game they likely win if Grant Williams doesn't foul out in regulation. In all but one of their 15 wins (a 76-73 win vs Gonzaga), they have beaten their opponents by double figures; they've won their four conference games by an average of 25 points. It's absurd how good they've been. Alabama is 2-1 vs Tennessee during Avery's tenure, including last season's 78-50 whipping of the Vols in Coleman. I'm sure the UT coaches and players have discussed that game. Alabama will likely be a double digit underdog in this game. Nobody expects them to win, not even us. Which means they likely hang around longer than expected because college basketball never makes much sense (just ask a South Carolina fan). This Alabama roster is talented enough to go toe-to-toe with anyone in this league, plus anything can happen in a 40-minute game. Unfortunately, this Tennessee team is a different beast, and it's hard to pick against them on their home floor.